These pierogies are made from scratch with a simple dough, and filled with freshly mashed potatoes. They are a delicious treat to make, and especially fun to make with friends and family. It seems like every culture has their dumpling, but today I’ll be showing you the Polish variety. What is a pierogie, you ask? It’s basically mashed potatoes inside of a dumpling, which can be flavored with whatever you want. Make a sour cream dough and roll it out on a floured countertop. 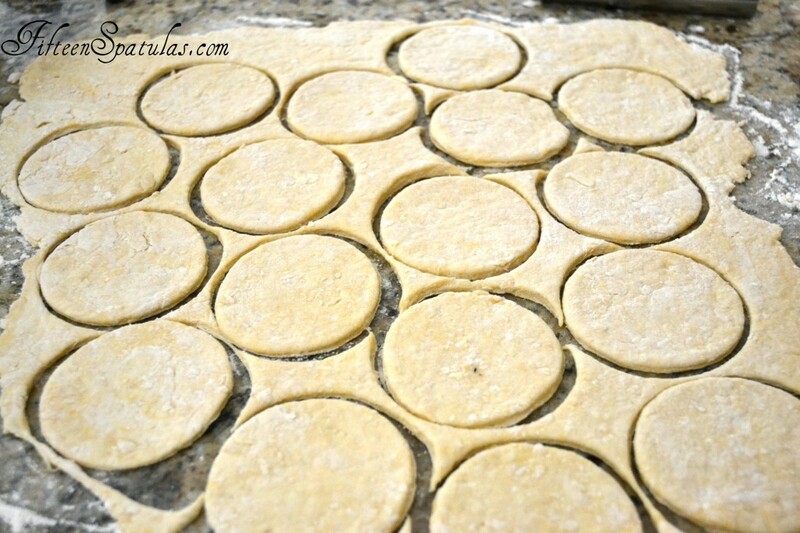 Cut circles with a biscuit cutter. Fill each dough circle with a small spoonful of mashed potatoes, and pinch the ends into a half circle to close it. Crimp the edges tightly closed with a fork. Boil the pierogies for 3 minutes, then remove from the water to drain. 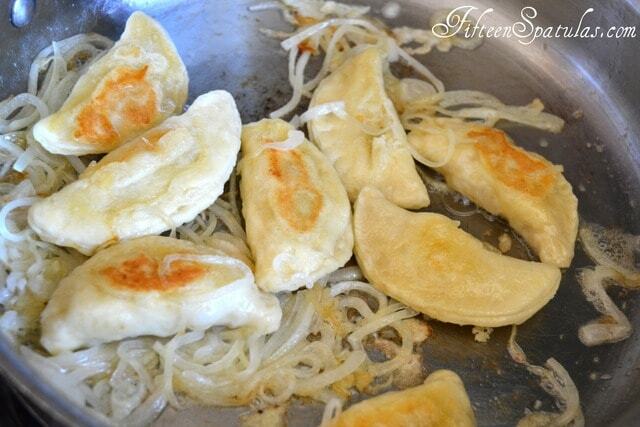 Pan fry the pierogies with some yellow onion, until the dumplings are golden brown. To make the mashed potatoes: Prick the potato all over with a fork and microwave for about 8 minutes until fork tender. Peel the skin off, and either mash with a fork or masher, or preferably use a food mill. Add the buttermilk, heavy cream, butter, scallions, and garlic to it, and season to taste with salt and pepper. Set aside for later. Whisk to combine the flour, baking powder, and salt. Add the eggs and sour cream, and mix until it forms a dough. Knead the dough gently on a lightly floured surface until firm and smooth. Add more flour if needed, and roll the dough out until very thin, about 1/8 inch thick. Use a biscuit cutter to cut circles. Bring a big pot of water to a boil, and season with salt. 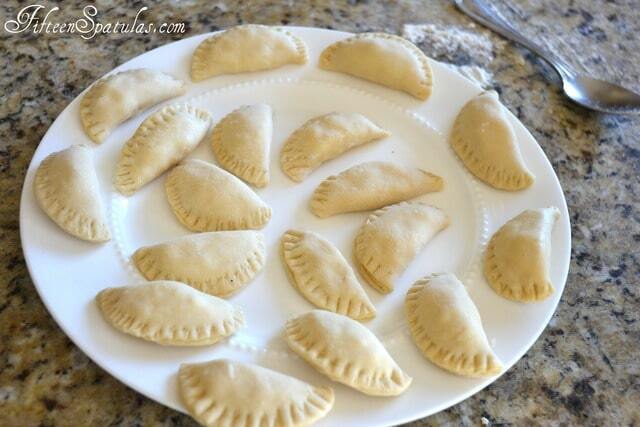 Fill each dough circle with a small spoonful of mashed potatoes, and pinch the ends into a half circle to close it. Crimp the edges tightly closed with a fork. Repeat with remaining ingredients. Heat up a skillet over medium heat and add 1 tbsp of butter. Add a small handful of yellow onion, and add just enough pierogies to the pan for a single layer. Fry the pierogies for about 2-3 minutes on each side, until golden brown and crispy. Repeat with the remaining pierogies. 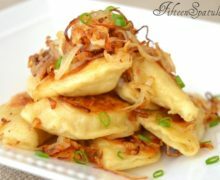 Serve the crispy fried onions with the pierogies, and enjoy! These have been served for Christmans Eve dinner as far back as I can remember, (although my dad was Russian). Eating them always makes me think of my Grandmother who has been gone many many years. We add Velveeta to the potatoes, I know “Processed” cheese, but let me tell it is great with the mashed potatoes! My mom, my sister and I would get together and make about 800 of them for dinner and then freeze and keep to enjoy the rest of the year. Just be sure to freeze them in a single layer on a cookie sheet before bagging them! I then get to remember my grandmother and now my mom all year long. Also, another way to know when the pierogies are done in the water is they will float to the top Try eating them with sour cream, Yum. Thank you so much for sharing your family memories and traditions. That’s one of the reasons I love food so much! I enjoyed reading your tips too =) Cheers and happy cooking! Made these and they were great. Thanks. Dona, I’m so glad to hear it!!! Thanks so much for stopping by to let me know. Happy cooking!!! Nice job. Can I recommend some crispy bacon on top also? Keep cookin!! I grew up eating pierogi a couple times a month, made by my grandmother, who emigrated from Poland as a young girl in the 1890s. I’m here to tell you, no true Polish pierogi is filled with mashed potato, or any other style of potato for that matter. 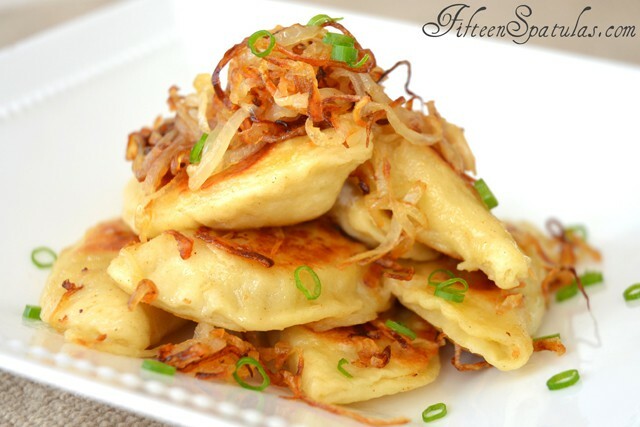 A true Polish pierogi has one of two fillings – Farmer’s Cheese or cabbage. Occasionally in the late sumer blueberries can be used. The traditional topping for pierogi is melted butter, either by itself or with onion and/or garlic added in.